Publications/Publicaciones: Sarah Finley. Hearing Voices. Aurality and New Spanish Sound Culture in Sor Juana Inés de la Cruz. Hearing Voices takes a fresh look at sound in the poetry and prose of colonial Latin American poet and nun Sor Juana Inés de la Cruz (1648/51–95). A voracious autodidact, Sor Juana engaged with early modern music culture in a way that resonates deeply in her writing. Despite the privileging of harmony within Sor Juana’s work, however, links between the poet’s musical inheritance and subjects such as acoustics, cognition, writing, and visual art have remained unexplored. These lacunae have marginalized nonmusical aurality and contributed to the persistence of both ocularcentrism and a corresponding visual dominance in scholarship on Sor Juana—and indeed in early modern cultural production in general. As in many areas of her work, Sor Juana’s engagement with acoustical themes restructures gendered discourses and transposes them to a feminine key. 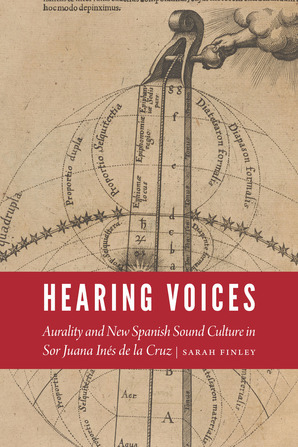 Hearing Voices focuses on these aural conceits in highlighting the importance of sound and—in most cases—its relationship with gender in Sor Juana’s work and early modern culture. 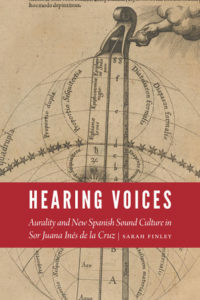 Sarah Finley explores attitudes toward women’s voices and music making; intersections of music, rhetoric, and painting; aurality in Baroque visual art; sound and ritual; and the connections between optics and acoustics. Finley demonstrates how Sor Juana’s striking aurality challenges ocularcentric interpretations and problematizes paradigms that pin vision to logos, writing, and other empirical models that traditionally favor men’s voices. Sound becomes a vehicle for women’s agency and responds to anxiety about the female voice, particularly in early modern convent culture. Publicación y presentación del libro: “Las escritoras españolas de la Edad Moderna. Historia y guía para la investigación” publicado por la editorial UNED y coordinado por Nieves Baranda y Anne J. Cruz.